In 1886 Allegheny, PA was the recipient of the first grant from Andrew Carnegie for a public library building in the United States. Carnegie's birthplace, Dunfermline, Scotland, was the recipient of his first grant for a public library in the world in 1881. Carnegie eventually gave grants for the erection of 1679 public library buildings in 1412 communities in the U.S.. Carnegie's grant to Allegheny totaled $481,012 and was for a cultural complex that included a public library and a music hall. The library opened in 1890 and was dedicated by President Benjamin Harris. The Carnegie Free Library of Allegheny later became a branch of the Carnegie Library of Pittsburgh. In 2006, while still serving as a library, the building was struck by lightning. It never reopened as a library. It was replaced with a new building at another location in 2009. The Carnegie building is now home of the New Hazlett Theater. It should be noted that Braddock, PA can also lay claim to being the home of the first U.S. Carnegie library. 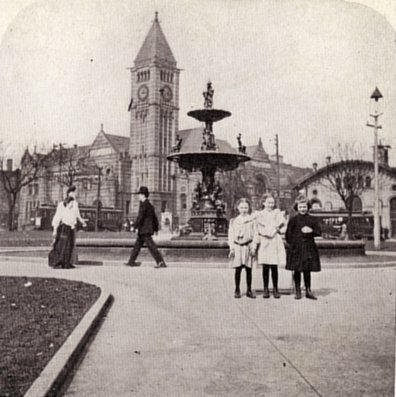 It received its Carnegie grant after Allegheny but its building was dedicated in 1889, a year before the Allegheny building. The Braddock Carnegie Library is still operational. The postcard above showing the Allegheny Carnegie is from my collection and was mailed on October 26, 1906. The stereoview showing the Allegheny Carnegie below is also from my collection. See other stereoviews in my collection. 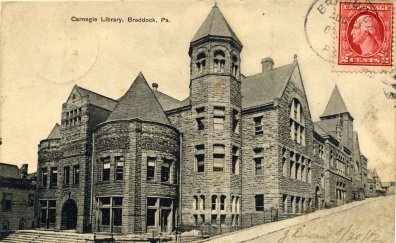 The last postcard image shows the Carnegie Library in Braddock, PA. In 1886 Allegheny, PA was the recipient of the first grant from Andrew Carnegie for a public library building in the United States. Carnegie's birthplace, Dunfermline, Scotland, was the recipient of his first grant for a public library in the world in 1881. Carnegie eventually gave grants for the erection of 1679 public library buildings in 1412 communities in the U.S.. Carnegie's grant to Allegheny totaled $481,012 and was for a cultural complex that included a public library and a music hall. The library opened in 1890 and was dedicated by President Benjamin Harris. The Carnegie Free Library of Allegheny later became a branch of the Carnegie Library of Pittsburgh. In 2006, while still serving as a library, the building was struck by lightning. It never reopened as a library. It was replaced with a new building at another location in 2009. The Carnegie building is now home of the New Hazlett Theater. The postcard above from my collection was mailed on October 26, 1906. 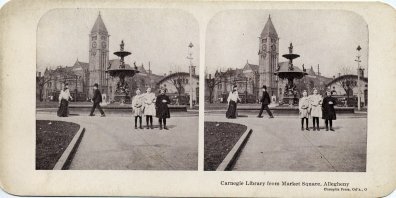 The stereoview showing the Carnegie building below is also from my collection. See other stereoviews in my collection. 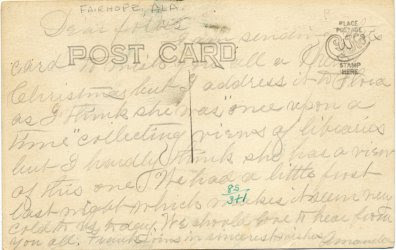 The Fairhope Public Library in Fairhope, AL has an interesting history which I learned about after acquiring the unusual postcard shown above. Fairhope was created as a Single Tax Colony in 1894. 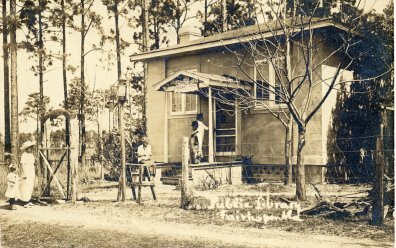 When Marie Howland joined the Colony in 1899 she established a library in her home. 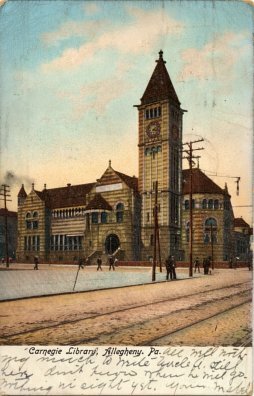 That library was later moved to the building shown on the postcard above. The postcard is a Real Photo Postcard (RPPC) depicting the Fairhope Public Library circa 1909. The postcard was evidently enclosed in a Christmas card. The message on the back of the card reads in part: " I am sending this card to wish you all a Merry Christmas but I address it to Flora as I think she was 'once upon a time' collecting visions of libraries but I hardly think she has a vision of this one." As I have indicated previously on this blog I value postcards with messages and I am especially interested in messages that point to a fellow collector of postcards. With the assistance of Norman D. Stevens I have created lists of past and current collectors of library postcards. The library system will be down Thursday December 20 for about 2 hours–from 9:00 a.m. to 11:00 a.m. During this time the library catalog will not be available nor will remote access to library databases. The downtime is necessary in order to upgrade one of the servers. We regret any inconvenience this may cause. In a recent exchange of messages to ALA's Library History Round Table listserv about my blog post on Charlotte Templeton, the question was raised as to whether the letter written by Templeton should be in an archive. That question is an entry point into a much larger discussion relating to the collections of individuals and their eventual disposition. In his Foreword to A guide to Collecting Librariana by Norman D. Stevens (Scarecrow, 1986), Maynard Brichford, former University Archivist for the University of Illinois, discusses the pluses and minuses in the relationship between private collectors and archives. He concludes with this statement: "Few human activities are completely divorced from pride, covetousness, lust, and envy, but humans know that it is more blessed to give than to receive. The best way to make your collecting count is to provide for the eventual transfer of your well-organized and well-documented collection to a research institution." It is my eventual intent to do just that with my collection of postal librariana. I have spent almost 18 years rescuing postal artifacts related to libraries from stamp dealers who have only an interest in the postal value of an artifact and little or no interest in in the library history significance of the artifact. At stamp shows I have gone through boxes containing hundreds of thousands of envelopes and postal cards in search of these items. In addition I search daily on eBay for examples of postal librariana. Finally, a select cadre of stamp dealers throughout the nation keep a lookout for these items on my behalf. (There are hundreds of other stamp dealers that look at me with a blank stare when I ask if they have any items related to libraries.) The result is that I undoubtedly have the largest collection of postal librariana (not including picture postcards) in the world. What began primarily as the collecting of postal items to help tell the historic story of libraries has also resulted in a research collection that tells the story of how libraries used the mail throughout their history especially in the United States. Back to my intent to pass on my collection of postal librariana to a research institution at some point in the future. I'm not going to let the results of what will soon be two decades of difficult collecting be widely dispersed back into the philatelic community. In the meantime, I hope to do more writing about how libraries used the mail. I will, of course, have to hope that at least one research institution will see the value in my postal librariana collection. For more on postal librariana click HERE and HERE.